I found another steamed cake recipe that’s for keeps. It’s called Mah Lai Goh, a Malaysian version of steamed cake; it’s simple and delicious, I like it especially because it’s not too sweet and it’s easy to make. 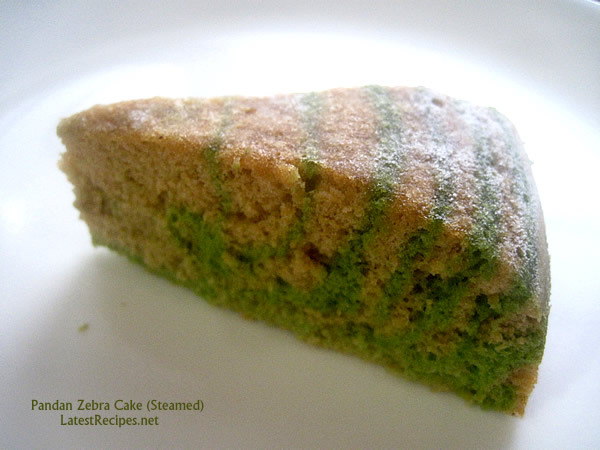 The zebra stripes is just an option; I just got inspired when I was making this and I happen to have pandan essence which (I think) goes well with the coconut milk in the cake. You can use any flavor or color should you decide to do it with the stripes too. I find that it tastes just as good plain with your fave cup of tea or coffee..
serve with just a dusting of confectioner’s sugar or.. Grease an 8" round pan with coconut oil or butter (or spray with baking spray) and line the bottom with parchment. Prepare your steamer; preheat by bringing the water to a boil with the lid on. Beat eggs and brown sugar in a mixer on med-high speed for 5 minutes. Add the coconut milk, vanilla and coconut oil or melted butter to the egg mixture and beat for 1 minute. Sift the flour, baking soda and baking powder in a bowl. Resift the flour mixture over the prepared batter. Gently but quickly fold in all the flour, careful not to deflate the air too much. Divide batter into 2. Mix 1 teaspoon of the pandan (screwpine leaves) essence or any flavoring with color of your choice into one half of the batter. Spoon about 3 tablespoons of white batter into the center of the cake pan. Next, spoon 3 tablespoons of the pandan (or colored) batter into the center of the plain batter. This causes the batter to spread out. Continue to alternate batters, in bulls-eye fashion until all batter is used. Cover loosely with foil and steam for about half an hour. Pour the batter into the prepared pan. Lightly cover the pan with foil and place the pan on the steaming rack. Cover and steam for about 30 minutes. Check for doneness by inserting a toothpick in the middle..if it comes out clean, cake's done. Remove pan from the steamer, invert on a rack after about 5 minutes and cool the cake completely before serving with a dusting of powdered sugar or drizzled with chocolate sauce or just serve plain. 2 Responses to "Zebra Cake (Steamed)"
First time i am seeing a mah lai koh in zebra stripes, lovely! I love mail lai goh! Thanks for this great recipe – love the stripes, makes it so much fun!